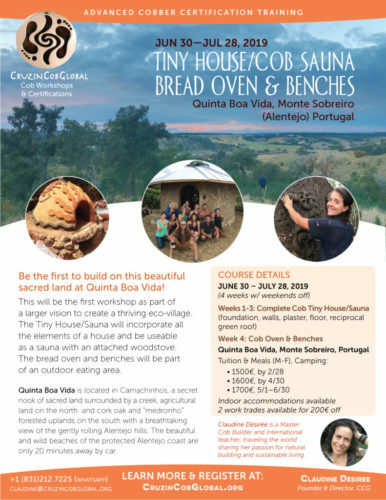 CruzinCobGlobal is on a planetary mission to teach cob building, as it is practiced in California and Europe. We lead workshops for local and international students who learn and build together, not only a beautiful ecological structure, but intercultural communication and understanding. It is a multi-faceted opportunity to learn cob building, a language, a culture and community living. We can also be hired for cob building projects and both of these happen where we find ready hosts/clients with available land and a desire for something new in their lives. Many of our students and clients are going through major lifestyle changes when they fall in love with the idea of cob and join a workshop. They are left transformed and closer to living their true calling, whatever it may be. After 7 years of teaching in the US, we are in the midst of a 3 1/2-year Global Cob Trotter Bike Tour teaching cob workshops around the Planet. We are proud to have launched the international model, CruzinCobGlobal in 2015, and have already taught 12 workshops in: Spain, the Canaries, Senegal, Cabo Verde, France, Morocco and Santa Cruz, CA since starting in March of 2015. In the Spring and Summer of 2017 we will be holding workshops in Cabo Verde, the Azores and Portugal . We will head back to the US for a month-long workshop (location still in process) that will be filmed on a Cable TV DIY channel in October. In November 2017 begins Part 2: Latin America and the Carribbean….always on bicycle of course! Heading to Cuba for an exploratory visit/ride for a potential Ecovillage and workshop site, then continuing on to Colombia. Brazil and Nicaragua in the Spring of 2018. The grand finale will be CUBA before heading back to California.